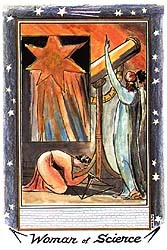 Today's Draw: Woman of Science from the William Blake Tarot. Do you tend to make emotional or knee-jerk decisions? Or do you tend to collect relevant evidence first, then wait until you can make an objective decision? Has your approach to decision making changed anytime recently? Today's card is about seeking out pertinent data and taking a methodical approach to solving a problem. The ladies in the card are all being very precise and scientific. They have put their emotions aside. And rather than making assessments of the situation, they are simply collecting information at this time. Later they can view all the information as a whole and draw more informed conclusions. Too often, we make decisions in the moment that don't have to be made in the moment. And, if you're like me, you often let emotions drive those decisions. I honestly feel like I've never made a decision I regret. I have no use for regrets in my life. Things are what they are. But even though I don't regret any of the decisions I've made, I can see where I could have made better decisions if I had just slowed down enough to take emotion out of it. And not just made better decisions, but also exited situations more gracefully and calmly. One of the things I've done in the past is walk away from things too quickly. But over the last year or so, I've taken my time and thought things through more. Back in February I wrote about a meetup group that I quit going to. It was something I thought about for a long time...weighed options and everything. I didn't let emotions rule my decision. And by giving myself the opportunity to be more objective, I was able to see the "truth" of the situation...my role, the role of others, the motivations beneath actions....what I would be losing, what I would be gaining. In the end, I think it was a good decision. I didn't make a fool out of myself upon leaving. I didn't walk away in anger or take a final parting shot. I just walked away. And while making the decision itself was a bit emotional, once it was made I was able to let go. I really haven't missed those meetups at all and I thought I would. Turns out I would have made the same decision if I had made a flip emotional decision, though. The difference is, if I had relied entirely on emotions, in retrospect I would have questioned the intentions behind the decision and wondered if I had walked away in a huff. Not out of regret, really. But it would have been part of a pattern I had followed before...one that would always make me question if I walked away out of fear or hurt or whatever. It's one thing to have hurt initiate a departure and another thing to have it drive one. And my objective is to not have emotions drive my decisions in ways it has in the past. When we take the time to step outside of an initial drama, we have the wits about us to make a more measured decision. We can look back at the pattern of a dynamic. We can see the "truth" of the relationship or situation. Maybe it's one-time thing and we're being silly and emotional. Or maybe it's part of a pattern that we're tired of repeating. Of course, this goes for happy decisions and bad, yesses and nos, joining and quitting, blah, blah, blah. On Friday we talked about clearing the fields. This is kind of related to that. It's saying that if you're going to clear the fields, at least give yourself the benefit of a measured and objective take on the situation. Well, as measured and objective as you can be. And also make a commitment that, once you're done burning the soybean field, you don't just go and plan soybeans again. So what about you? Are you on the verge of a rash decision?